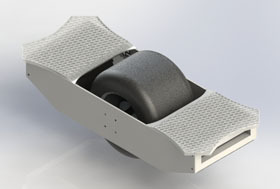 Sam Doyle designed and built this one-wheel powered skateboard. A gyroscopic system keeps the board level and the skater (with some practice!) more or less upright. 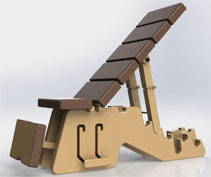 SolidWorks enabled him to model and test each component and predict the performance of the assembled machine. Ben Taylor set out to design a fully integrated bike where all mechanical systems would be integral to a monocoque frame design. To narrow the task to manageable proportions, Ben concentrated on the handlebars and 3D-printed a series of patterns using their Stratasys Dimension for sand-casting in aluminium. Vinay Patel’s design for an exercise bench takes full advantage of SolidWorks to model a more organic solution to a design more often based on steel frame construction. Good use of rendering really sells the concept to the customer or a potential investor. As reported last month, we were delighted with the response we received to our Schools design competition. So, without further ado (as they say) the overall winner was Sam Doyle from Langley School in Norwich with Vinay Patel from Queen Mary’s Grammar School, Walsall in second place and Ben Taylor also from Langley School coming a very creditable third. No prizes I’m afraid, but Robert Thurtell from Langley came in fourth with Gaurav Bhalla from Queen Mary’s getting fifth spot. 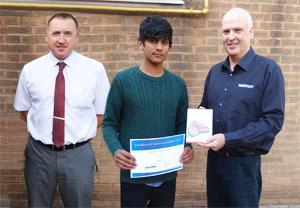 Robert and Gaurav both completed their work at GCSE level. 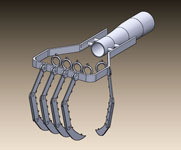 Gaurav’s mechanical hand was an extraordinary feat of both technical design and biomimicry. All entries were judged ‘blind’ so the fact that Langley and Queen Mary’s took all the top spots is testimony to the quality of the work their students are doing. So what set them apart and what was it that SolidWorks judge Andrew Gregory found that deserved such credit? In many ways, the adoption of SolidWorks in education mirrors how 3D CAD has grown to become the norm for commercial design. Broadly speaking, adoption starts with being able to visualise an idea in any number of ways to realistically test both visual and technical properties. 3D CAD modelling requires very similar thinking skills to hands-on model-making so SolidWorks then gives designers a rapid means to check the ‘how’ and the ‘what’ as they explore ideas. Behind each model is a data-set of related and defined geometrical properties, this data can be compared to data built into SolidWorks. In practice, this means you can then use tools within SolidWorks to, for example, stress test your model, check its carbon footprint, animate it as a working assembly or cost and test production methods. Students from St Mary’s and Langley School used SolidWorks in all these ways to model, explore, represent and test. 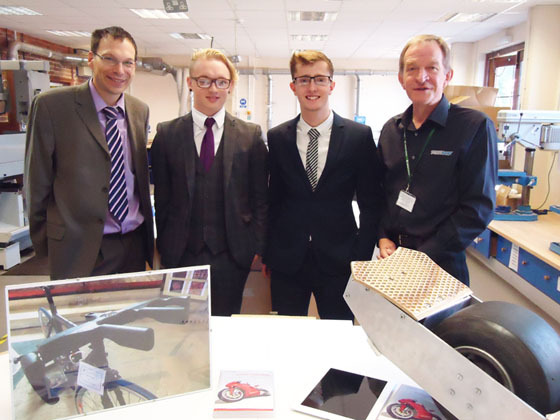 This really is getting to the heart of the matter and, having now met and chatted with all three winners, it is clear they all use SolidWorks as naturally as any designer might use a sketch pad, mock-up or calculator. Congratulations to all entrants, their teachers and the winners but special mention must go to John Norton and Paul Hughes, Heads of D and T at Langley and St Mary’s respectively. All three winners are now at University studying Design and Engineering - what better tribute to John and Paul’s expertise and encouragement.